. . . and babies make four. : Michal's Room . . . it's all about pink. Michal's Room . . . it's all about pink. I've started working on Michal's room in all its pink glory. You may remember that Michal declared that our local ice cream parlor was "just her style." Well, this is the ice cream parlor of her dreams. She told me that what she really likes about the ice cream parlor is the pink and green stripes on the lower half of the wall. So, we're going to use that pink-and-green color scheme as our jumping off point. I'm trying to find a very pale shade of pink paint for the walls that she'll approve of but won't overwhelm the room. I learned the hard way that the trick with pink paint is avoiding the Pepto-Bismol effect. You may remember my pink wall disaster in the girls' nursery. I'd like to avoid repeating that. Hmmm. That nursery color looks a lot like the ice cream parlor color. I think I like Benjamin Moore Powder Blush or Benjamin Moore Pink Cloud -- a very pale pink -- and I've painted a little on the wall to see how they look in the room but I'm still not ready to commit. 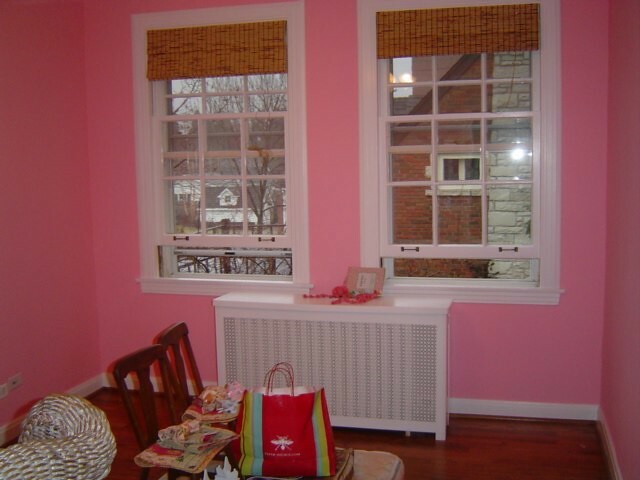 I also like Benjamin Moore's Ballerina Pink and Pink Innocence. It's funny how different they look side-by-side but when you're not comparing them you'd swear they were all the same shade of light pink. Michal's room has a darling built-in day bed, all kinds of fun angles in the ceiling and a great white chandelier with cute matching sconces. 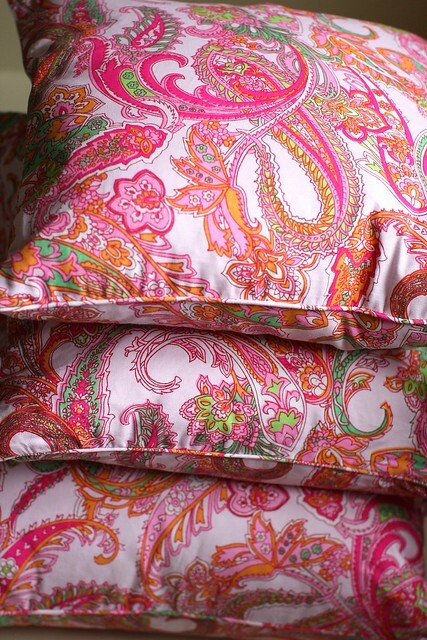 The fabric is fantastic quality and the pillows are beautifully-made and down-filled. I bought every one they had on the shelf at the store where I found them. They had them in three sizes and I also found awesome lumbar pillows in a geometric print that works well with the other print. After going to a second Home Goods I was able to find enough pillows for both her bed and the day bed. Plus, they were a great deal. I still have a lot to figure out but it's a start! And best of all Michal's as excited as I am. Good luck deciding - and please let us know what you choose. I just finished going through this same dilemma. 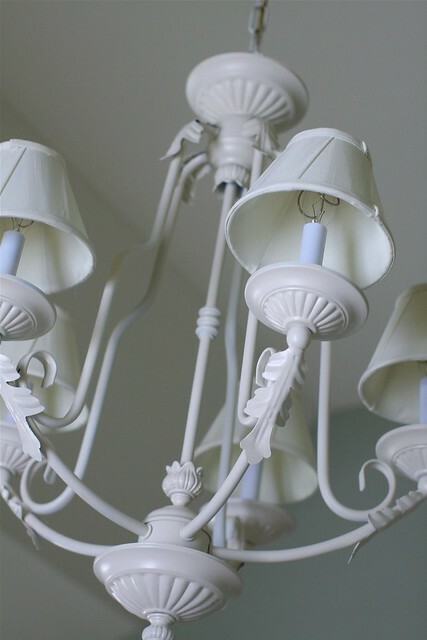 We went with the Benjamin Moore powder blush. We are happy with our choice. Thanks so much for letting me know you went with Powder Blush. Is it subtle? Do you love it? I've seen lots of darling rooms online with Powder Blush walls. I really want a pink that whispers, not one that screams and I think I really like Powder Blush. I loved the story elements you had painted in their room your old house. Will you do anything like that in their rooms in the new house? I am very happy with the powder blush and my daughter loves it! I wanted super subtle and kind of wanted to lighten it a touch - but know that if I did it would be too light. I ALWAYS have a terrible time with paint colors and usually change after the first coat - so we purchased the smallest amount possible and painted a sample on the wall to see! I would highly recommend doing that! I think the powder blush is nice because it has a little warmth to the color. I was also trying to avoid the pepto bismol / bubble gum effect! Oh, I love your decorating projects! Just last week we painted our new daughter's room Pink Cloud and I absolutely love it! It is the first time I've painted a room and not second-guessed myself! Her bedding is mostly white, with accents in darker pink and apple green. Pink Cloud is pink . . . more than a "hint" of pink . . . but it is soft and lovely. 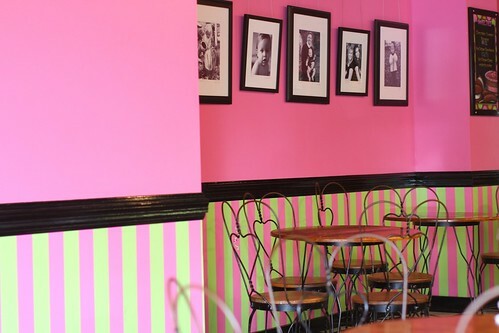 This looks like the inside of one of my favorite ice cream parlors in downtown Wheaton!! I was google-ing "pink and green striped rooms" as I attempt to make a 4yo room much girlier than it is....living in Peru is making it a challenge as I can't just find a Benjamin Moore color and ask for that. Benjamin Moore hasn't made it this far south yet. :) Thanks for your sweet blog!